Precision application starts with precision manufacturing – and Highway Equipment Company (HECO) has been building the best since 1939. 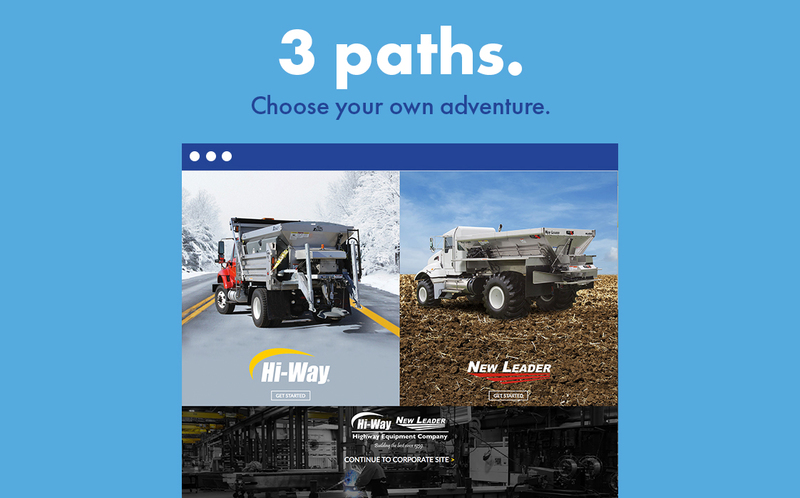 HECO is the leading manufacturer of New Leader® crop nutrient applicators and Hi-Way® road maintenance and deicing equipment. They are committed to building innovative equipment and delivering superior customer service to ensure consistent and reliable experiences for our customers and business partners, and McD was thrilled to partner with them in their marketing efforts. Because HECO manufactures two different product lines with equally different end-user markets, when they approached McD Digital for a new website, we knew we had to come up with a solution that utilized cutting-edge UX and UI design. Our research indicated that most users will either have an interest in their ag division or Hi-way division, not both. So we took their original website and redesigned it to feature three distinctly separate paths to better target their audience. Once users select a path from the main landing page, they are taken to a product line landing page devoted specifically to Hi-Way or New Leader products. Essentially, McD created a three-in-one site, with Hi-Way, New Leader and HECO corporate each having their own path and navigation. Even the branding, menus and imagery change to be specific to the brand once a user clicks on a path. These focused sites also give users an easy way to locate a dealer near them, showing only those that support that specific product line. The new website also gives Dealers easy access to log into their secure accounts. Because this feature utilizes permission-based viewing, each dealer’s menu changes based on their approved permissions. This offers dealers a full-service solution, so they have one single point of access to manage marketing materials, pricing, and support data for their equipment. The dealer site also ties into their backend system, so HECO can focus on putting dealer needs first and help manager their fleets of inventory. Is Mobilegeddon Really Upon Us?